allan kellehear is Professor of Sociology at the University of Bath. 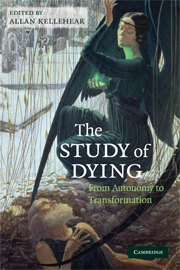 The study of dying : from autonomy to transformation / [edited by] Allan Kellehear. 1. Death–Social aspects. 2. Death–Psychological aspects. I. Kellehear, Allan, 1955– II. Title. Cambridge University Press has no responsibility for the persistence or accuracy of URLs for external or third-party Internet websites referred toin this publication, and does not guarantee that any content on such websites is, or will remain, accurate or appropriate.